﻿Examples of Governance Processes are: performance reviews, problem management processes, escalation procedures and other operational management processes; also service request management processes, project workload prioritization processes and other demand management processes. 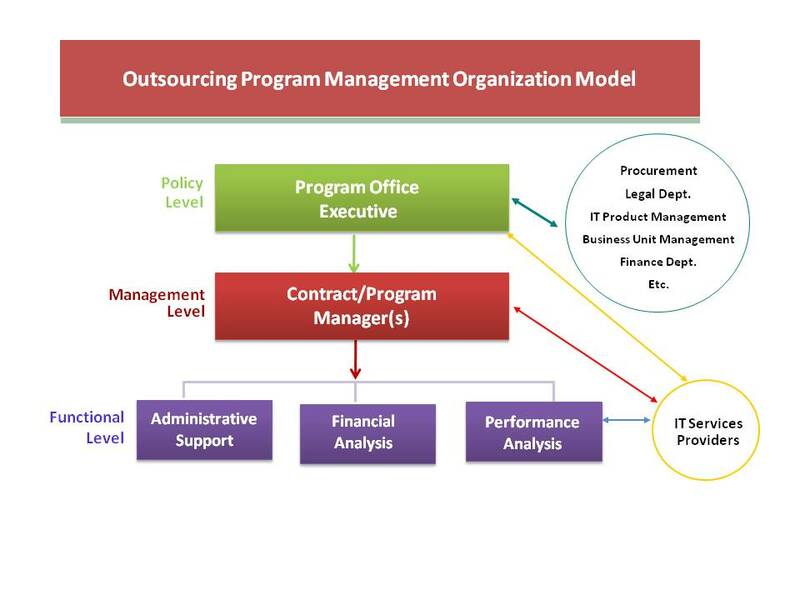 Governance Organizational Structures include global and local outsourcing program offices, project management offices, contract management functions, joint executive and service delivery management (“governing”) committees, and the like. Governance organizations are needed to manage internal or external contract and day-to-day service delivery and related operations. They also facilitate provider/client relationship management, joint problem analysis and risk management, and collaborative, proactive management and strategic planning. Managing proper governance oversight is instrumental with respect both external outsourcing contracts, as well as internal SLA agreements with your in house service provider or Shared Services organization. Gaining agreement on priorities for expenditure and appropriate allocation of resources across the enterprise. Once your business has invested in implementing structures and tools to optimize the organization’s productivity and control costs, good governance must be in place to maximize your company’s return on its investment. Governance services help accomplish this critical task. Governance practices have both strategic and tactical dimensions. Engaging TBI’s consultants as you put these practices in place will aid you in aiming at assuring consistent best practice management processes that maintain the new alignment of operations and IT with business requirements. Corporate governance is now an essential role of every business plan and getting it right takes re-examining the structural process arrangements needed to produce a desirable outcome. Over our long history, we have helped multiple vertical markets implement a strong governance plan. We have provided an abstract for a Global Bank’s IT operations and their existing Vendor Management contracts. FAO Research, the only independent research firm focused exclusively on Finance and Accounting Outsourcing related issues, interviewed TBI on how we handle corporate governance. Drawing on our 40 years of consulting TBI discusses its governance practice with FAO. The complexity of doing an outsourcing project when dealing with finance and accounting can be difficult to navigate. Our professional team of experts has guided our clients through the maze of possible dangers by helping them to achieve a strong and stable governance plan. We provide clients with guidance and assistance in establishing organizational models that help your company proactively manage transformation through governance. For example, we have tools that help ongoing activities such as prioritizing expenditures, allocating resources, evaluating the effectiveness and efficiency of new processes, and gaining a clearer understanding of your customers’ needs. TBI teams assist companies as they navigate through the complex regulatory requirements and auditing standards affecting information management.